Partnerships with lending institutions, industry professionals, communities, and private individuals made all of the work possible. With Utah's affordability housing crisis and a greater need than ever. Please consider a donation to help us bring more high-quality housing and services that meet the needs of our communities and workforce. If you are curious how to help, contact us. We'd love to explore those possibilities with you. 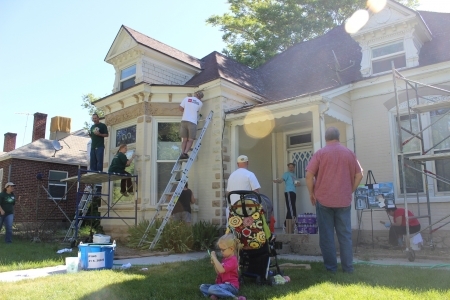 As part of Provo City's revitalization efforts in 2000 a Home Purchase Plus down-payment assistance program was implemented. It is designed to strengthen core Provo neighborhoods. Down-payment assistance is available for low-income families/individuals through the Provo City Redevelopment Agency. Information about the program, an application, and qualifications can be found at the link below. NeighborWorks Mountain Country Home Solutions provides many different counseling services to assist you in your needs. NeighborWorks provides Foreclosure Counseling through Mortgage modification assistance, Pre-purchase Homebuyer education, Credit Repair and Budget counseling. Whatever your needs may be NeighborWorks is here to help. NeighborWorks Mountain Country Home Solutions is committed to the community. Learn how you can get involved in your community through service projects such as Paint your Heart Out. Central Park Station is NeighborWorks Mountain Country Home Solutions premier new development at 400 West between 500 and 600 South in Provo, 2 blocks west of the Front Runner Station. The 59-unit development consisting of 4 1-BR units, 33 2-BR units, 16 3-BR units, and 6 4-BR town homes. Site amenities will include covered parking, a tot lot, bike racks, a raised-bed vegetable garden, exercise facilities and on-site storage for each unit. To ask about rental or to be added to the wait list you should contact the property manager using the button below. Franklin commons has definitely upgraded my neighborhood. I used to hate to admit this area was part of my neighborhood and did not want my children to go near that area. It was not only an eyesore but it was frightening. Now I choose to drive by there and it is a source of neighborhood pride. It has gone from a neighborhood weakness to a neighborhood strength. We wanted to take a minute and let you know how much we appreciate all that you have done for us. You have gone above and beyond all expectations to help us get our loan modification complete. It was a long process and you were extremely helpful, you always made time for us when we had any questions. You have been a life saver, thank you again for all you have done for us and helping us save our home. With much appreciation. Our street is safe and full of the activities of families rearing children - walking to and from school, busy playing outside all year 'round, and fathers and mothers going to and coming from work. In fact, it reminds me of the way the street looked when Guy and I, and so many other woking class people like us, were raising our family here.